Thaw shrimps. Peel the red onion and chop. Chop the red sweet pepper and dill. Pour the sour cream in a bowl, add the red onion and red sweet pepper. Peel the garlic and grate it. Add the tuna, mustard, honey, lemon zest and juice, salt and black pepper. Finally, add the defrosted shrimps and chopped dill. Check the taste. Keep in the refrigerator for two hours. Garnish with dill. Serve cold with (hot) oven potato. Start by washing the potatoes and wrapping them individually in foil. Bake potatoes in oven at 225 degrees C/440 degrees F for 30 minutes first. Reduce heat to 200 degrees C/400 degrees F and bake until the potatoes are cooked, depending on the size, 30 - 60 min. Open the foil or remove completely. 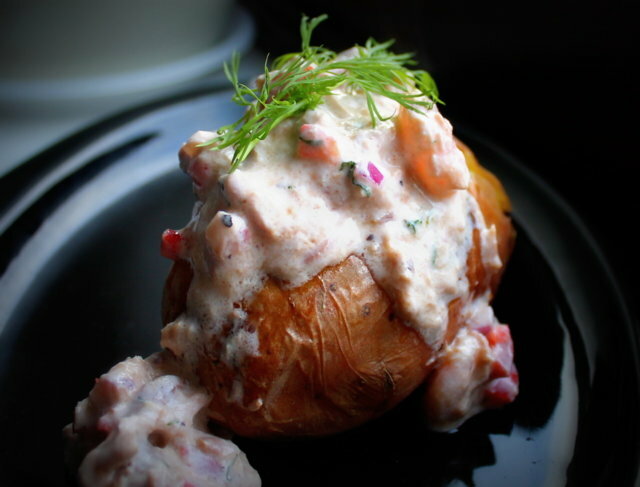 Pull a cross in potato and squeeze out a bit of the interior. Serve with with toppings of your choice. I made this today and loved it! SO tasty! Thanks for the report, o.b., which bumps up a recipe and photo that I missed first time around!